Sweet potato pie is a Southern staple during Thanksgiving. My husband’s family is not too much into pumpkin pies, but sweet potato pies are a must. It’s just not Thanksgiving without them. 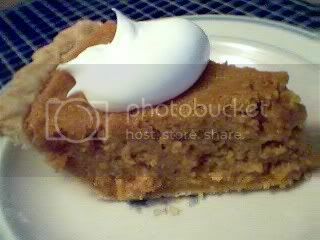 My mother-in-law, Dot, made the best sweet potato pie, not too sweet, not overly spiced. Like most good cooks though, she didn’t have a recipe; she just cooked by feel. When it felt right, then it was time to put it in the oven. This is one of of her recipes that I cajoled her into sharing with me. For some reason that I find strange, many Southern cooks don’t like to share their recipes. So one occasion when she was making these, I watched her and approximated the proportions. She was so funny, because once in a while I’d catch her shield the bowl and throw something in there. I’d say, “Now what did you just put in there, Mom?” and she would say nonchanlantly, “Oh, nothing, I was just tasting it” and smile. She says that is her secret, she tastes as she goes along, and stops adding ingredients when she feels and tastes it to be right. This recipe comes very close to her pies, but I think there is just something special that moms and grandmas add to their cooking that makes it special and reminds you just of them. I hope my daughters will someday look back and think the same way about the foods we’ve shared. 2 Deep Dish Pie Crusts (I used the ready-made, store-bought stuff, but if you want to make your own from scratch, Manang Kusinera has a very good recipe and step by step method of making pie crust on her blog. Bake the sweet potatoes for one hour in a 350 degrees F oven. You can also microwave or boil them, I just prefer baking them. Just make sure you leave them whole, don’t peel and slice them yet as they would absorb too much liquid. Cool after baking, and peel, then mash. In a large mixing bowl, mix all the ingredients until they are well blended. Momma Dot used to mix hers by hand, but she says that she discovered, when you mix with an electric mixer, the beaters pick up the stringy strands and give a much smoother pie. Just don’t scrape the beaters after mixing, although it may seem the frugal thing to do. You’ll see what I mean when you clean the beaters. Divide the batter into the crusts. At this point, you can freeze the pies to bake at a later time. Bake at 400 degrees F for 10 minutes, then lower the temperature to 350 degrees and bake for an additional 40-50 minutes. Cool before serving. Can’t wait to see the purple sweet potato pie. Momma Dot’s very coy re: her cooking ha. This is so timely JMom because husband came home from work yesterday raving about his work colleague’s sweet potato pie and asked me to think about making it “next time” (he’s even looking for a recipe na). Somehow he’s surrounded by co-workers with Southern roots. Happy day…Now I have Momma Dot’s authentic sweet potato pah!